Australian batsman Phillip Hughes died Thursday from a head injury after a sickening on-field blow in one of the highest-profile sporting fatalities since the death of Formula One great Ayrton Senna. Hughes, who was due to celebrate his 26th birthday this weekend, never regained consciousness after being hit on the base of his skull by a rising ball as he batted for South Australia against New South Wales at the Sydney Cricket Ground on Tuesday. "It is my sad duty to inform you that a short time ago Phillip Hughes passed away," Australian team doctor Peter Brukner said in a statement. "He never regained consciousness following his injury on Tuesday. He was not in pain before he passed and was surrounded by his family and close friends." 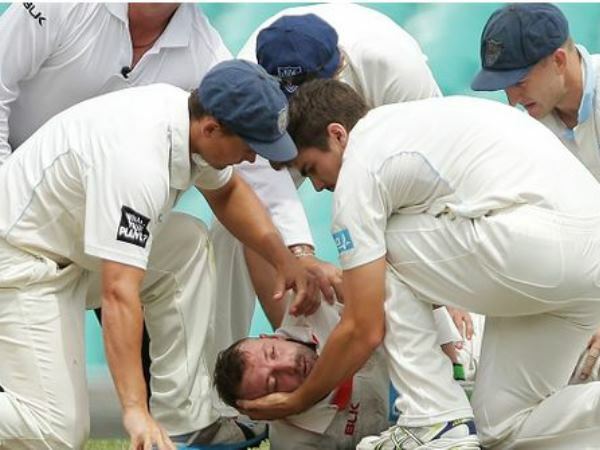 Hughes, who played 26 Tests, crumbled to the ground unconscious after the blow despite wearing a helmet. He underwent emergency surgery in hospital to relieve pressure on his brain and had been in an induced coma since. Reports said he suffered a fractured skull and catastrophic bleeding in his brain. His tragic death was one of the highest-profile sporting casualties since Senna was killed in an accident while leading the San Marino Grand Prix in 1994. More recently, 20-year-old NASCAR driver Kevin Ward Jr. died after being struck on the track in August in New York state. Test stars Shane Watson, Brad Haddin, David Warner, Mitchell Starc and Steve Smith were among a stream of personalities from the world of cricket who visited Hughes' bedside, hoping for the best, with emotions running high. An inconsolable Australia captain Michael Clarke was an almost constant presence at his close friend's side at St Vincent's Hospital. News of his death broke just before long-time teammate Warner and his wife left the hospital in tears. Dozens more players were hugging and crying into each other's shoulders as they walked out minutes later. Prime Minister Tony Abbott led the tributes. "Phillip Hughes was a young man living out his dreams. His death is a very sad day for cricket and a heartbreaking day for his family," he said. "What happened has touched millions of Australians. For a young life to be cut short playing our national game seems a shocking aberration." Cricket NSW chairman John Warn and chief executive Andrew Jones said they were stunned, saying the grief would be felt around the world. "Phillip touched so many people playing for NSW, Australia, South Australia, county cricket in England and the IPL in India," they said. Hughes made his Test debut in South Africa in 2009 where he made 75 in the second innings at Johannesburg. The left-hander followed up in the second Test at Durban with centuries in both innings, amassing some 275 runs at the crease. The runs dried up and despite playing 26 Tests he never secured a regular place in the national team, partly due to his perceived weakness against the short, rising ball. But with doubts over the fitness of Clarke for the first Test against India next week in Brisbane, he was seen as a potential replacement. That Test is now in doubt with many of those due to take part close friends of Hughes who will struggle to focus. His death came as questions were raised about a delay in the response after the initial emergency call for help was made. Sydney Cricket Ground officials said a call was made six minutes after the batsman collapsed at 2:23pm, but the ambulance did not arrive until 2:52pm. A helicopter and another ambulance were also dispatched. While waiting, Hughes was given CPR and mouth-to-mouth resuscitation by NSW team doctor John Orchard before being rushed to hospital for scans and surgery.